POND HILL, Nevis — Tropical Storm Isaac appeared “poorly organized” and was weaker on Wednesday afternoon as it moved closer to the Caribbean. Forecaster Frank Goodwill said Isaac picked up a little speed Wednesday afternoon as it moved west. “The National Hurricane Center continues to categorize Isaac as a tropical storm,” Goodwill said. “Looking at a recent satellite picture it looks a bit of a mess, lacking clear definition. Goodwill said in the Nevis Peak foothills showers continue and have measured more than half-an-inch of rain so-far today. The rain has remained variable and squally during showers. As of 5 p.m., Tropical Storm Isaac was about 295 miles east of Martinique and moving rapidly west at 20 mph. On that path Isaac will move across the central Lesser Antilles and into the Caribbean on Thursday. Wind shear continues to take a toll on the storm, and computer models indicate the shear will stay on the moderate to strong side for a while. Some of the models show Isaac degenerating into a tropical wave near the Lesser Antilles. But after that things could change. 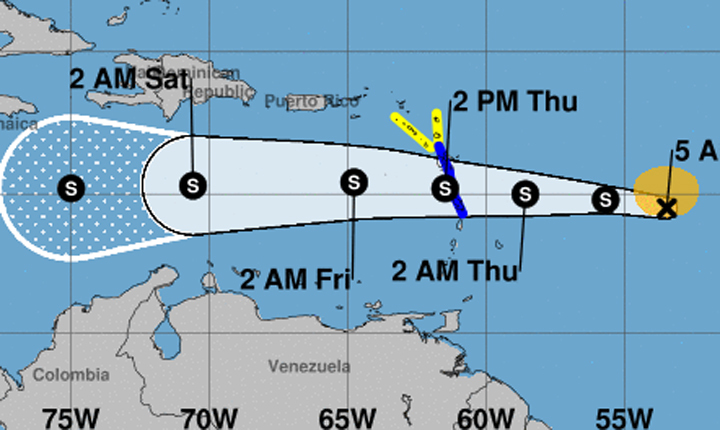 Isaac could escape the wind shear that has been tearing it apart and find a more favourable environment by the time it makes it to the western Caribbean, the Hurricane Center said Wednesday afternoon. Models now suggest Isaac could re-strengthen in the western Caribbean. Some — but not all — show it becoming a hurricane again.